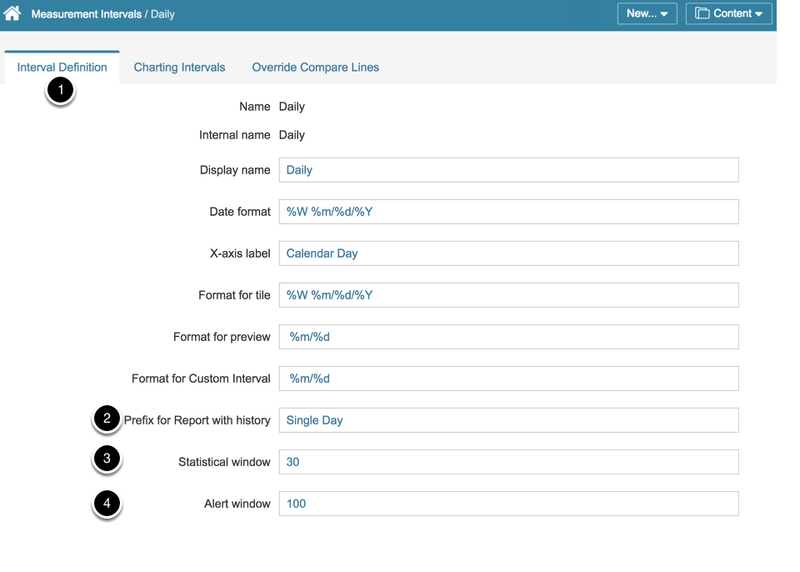 Your Metric Insights instance comes with a standard set of Measurement Intervals, each of which has a series of settings that control such behavior as display of values, alert parameters, default naming conventions, and chart labels. An Administrator may review and edit most of these fields. You can also specify those Charting Intervals that apply to each Measurement Interval. You cannot add or remove any Measurement Interval. If your business requires a new Measurement Interval, contact support@metricinisghts.com in order to request that a new one be provided. Since significant development is involved in implementing a new Measurement Interval, there is no "quick fix". The Measurement Intervals list opens. Select a Measurement Interval to be updated and you are going to be redirected to the Measurement Interval Editor. For this example we choose 'Daily'. Alert window: sets value used with the interval's unit to construct an interval expression that determines if a Metric value is too old for alert processing. In this example, if data is recollected for 6 months, alerts will only be generated for the most recent 30 day period. 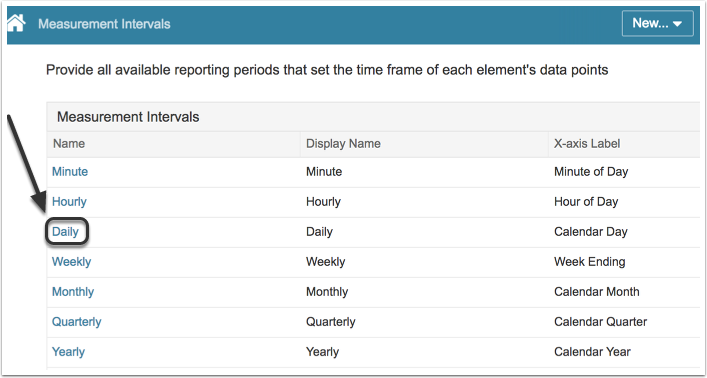 Modify, Delete or Add Charting Intervals to be available to use for comparison values for Metrics with this Measurement Interval. For more details, refer to: What is the Impact of Charting Intervals on Charts? 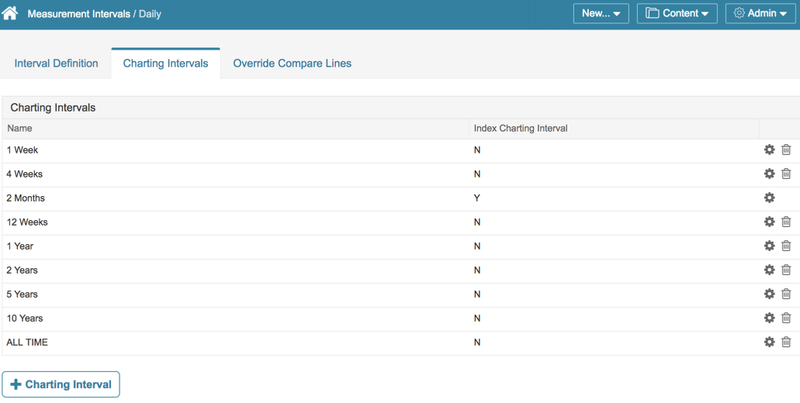 Modify, Delete or Add Compare Lines to be available for use in charts for Metrics with this Measurement Interval. For more details, refer to: Why are there Compare Lines only on some Metric Charts? NOTE: Compare Lines lists the compare lines which Users may select to use for the Measurement Interval. Standard Compare Lines (lower grid) lists the compare lines that are default for this Measurement Interval. Next: Why don't my Element tiles, tables and charts have a currency symbol?